The Port of Venice is accessible year-round 24/7. Served by 45 km of railroads, it is directly connected to the European transport corridors' rail and roadways. The Port of Venice is situated in the Venice lagoon and can be accessed year-round, 24/7. Constituted of two port areas, Marghera and Marittima, the port offers 20 km of quayside where ships are berthed. The Port of Venice is also the only port in Italy with an inland waterway port enabling ships to sail up the Po plain. The Port of Venice is served by an internal railroad network of 200 km. It has its own marshalling yard and is connected to the main international railroad corridors. The Venice Port Authority plans to extend its internal railway system as a means to support intermodal and sustainable transport. 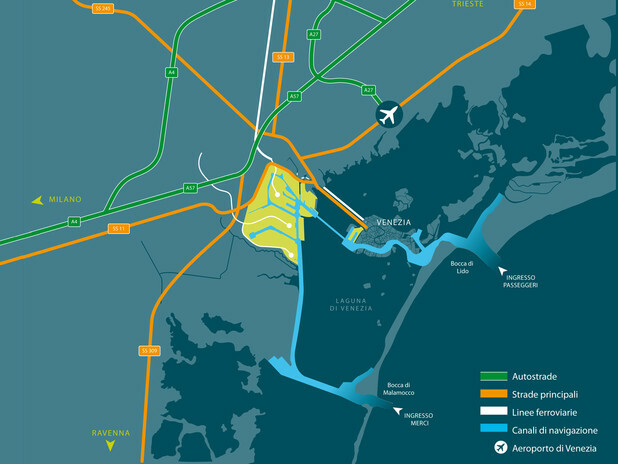 The Port of Venice has direct access to national and European roadways (Corridors I, V and the Adriatic-Baltic corridor). The Venice Port Authority is striving to improve the road access to the commercial and passenger terminals. This will also relieve roads from heavy traffic and increase their safety.